I'm just coming to the end of a week helping out at Llannerchwen, our retreat centre near the Brecon Beacons. If the British climate is "variable", then the weather here is usually the epitome of that, and so I packed layers of clothes, with chilliness and rain principally in mind. And yes, there has been a bit of drizzly rain, and some heavy clouds and mists; but mostly, surprisingly, the week has been filled and blessed with sunshine! So we've started a few days with some splendid sunrises, regally gradual in their unfolding. 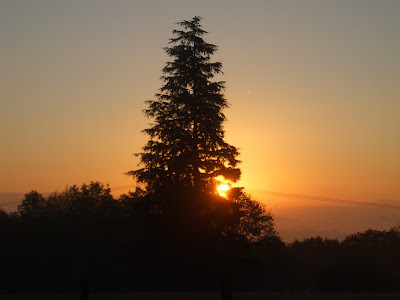 Heralded by a deepening pinky glow seeping into the surrounding pale bluey-grey, the sun has eventually appeared from behind a tree or a shrouding cloud; not just shining but blazing, turning grass and gateposts to gold and dewdrops into thousands of tiny, sparkling jewels. On some days the sun has played hide-and-seek with the clouds, on others it has blazed unimpeded from a brilliant blue sky. With daytime temperatures in the mid-teens, butterflies and bees have emerged to flop, drowsily, on sedum, and ripe, late blackberries have enticed me into a bout of purple-fingered picking, and the inevitable stinging and scratching. The last few nights have been clear, with huge, diamond-bright stars filling the velvety sky. 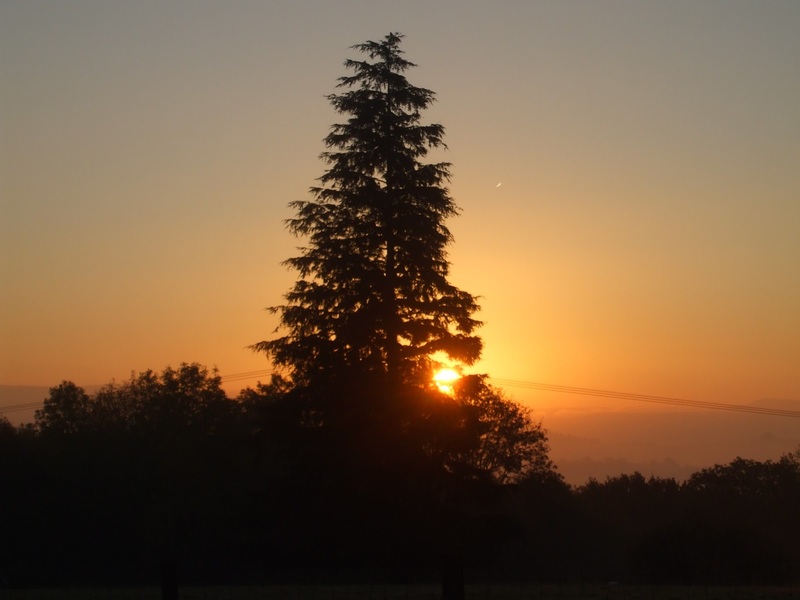 In such beatitude, and in the morning stillness, I can sink easily into prayer and reflectiveness, into seeing God alive and active in all of creation. Yes, the trees proclaim that it's autumn, their leaves turning copper and gold, drifting down in the windless stillness, many already underfoot... but for a few days the sun has held us in a liminal, almost dreamlike state of not-quite summer, not-quite autumn. 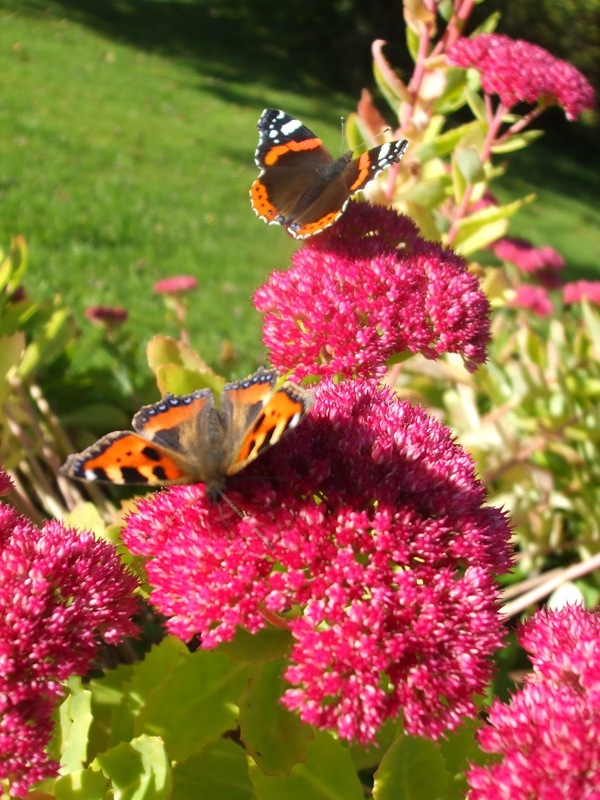 It has definitely been a surprise, but also a tremendous blessing, and the discovery this morning that our sedum's popular name is 'Autumn Joy' gives a name to how this not-quite season of a week has felt. Autumn joy it has been, and as I prepare to drive home later today, autumn joy is what I hope to take with me back to Oxford and whatever lies ahead.